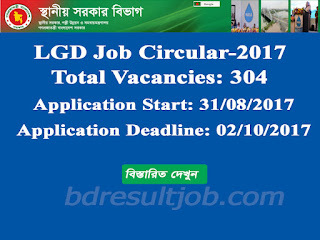 Local Government Division (LGD) Job Circular 2017 has been published in http://www.lgd.gov.bd. Local Government Division (LGD) 304 vacancies position for Assistant Engineer and Deputy Assistant Engineer. Every interested Bangladeshi person can apply for this job within specific time. Local Government Division (LGD) Office Job Circular has been given bellow. 2. Only Local Government Division (LGD) determinate ‍application form can apply otherwise application will not accept. Every Interest ligal canidate to http://www.lgd.gov.bd at download and print their application form. Only Local Government Division (LGD) Office determinate ‍application form can apply otherwise application will not accept. 1. http://www.lgd.gov.bd collect your appliaction form download and print A4 size paper and It's filup carfully all. 2. Passport size color photo 4 (Four) are attached Application and admit card designated place. 3. The applicant's address along with the stamp will have to be submitted with the application of the double envelope. 4. For the post 200/- Tragary challan 1-3701-0001-2031 (sonali bank). Bank Draft, Postal Order and Pay Order not accept. 5. Must include return 9.5 * 4.5 inch envelope with write candidate present address and attached 10/- taka post ticket. 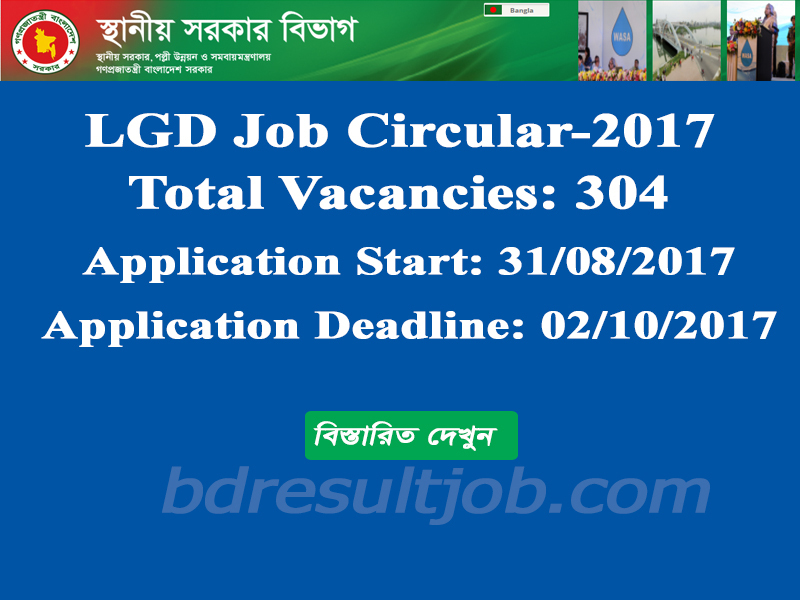 Tags: Local Government Division (LGD) Job Circular 2017, Local Government Division (LGD) Job Opportunity 2017, LGD Job Circular 2017. LGD Assistant Engineer Job Circular 2017, LGD Assistant Engineer Job Opportunity 2017, lgd job circular 2017, LGD Deputy Assistant Engineer job circular 2017, LGD Deputy Assistant Engineer exam date, LGD Assistant Engineer exam date, LGD Assistant Engineer exam result, LGD Deputy Assistant Engineer exam result. Local Government Division (LGD) application form download. Local Government Division (LGD) Job Circular Job Circular 2017,LGD Deputy Assistant Engineer exam date, LGD Assistant Engineer exam date, LGD Assistant Engineer exam result, LGD Deputy Assistant Engineer exam result.